As I had hoped, last night I joined the sleeves and the body of Stopover. I knit for a while and got almost to the decreases and from there it’s a short trip to the colorwork and then it’s pretty much done. The goal is to finish by Saturday so that it’s done before our vacation. I think I can . . . I think I can . . . I think I can . . . Looking great! I joined the sleeves to the body and went to bed. I wanted to decide where to place some short rows and try it on before I proceeded. Did you do any? 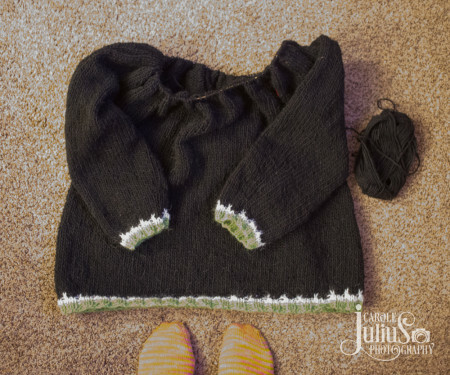 Very pretty sweater; can’t wait to see the colorwork! Have a great vacation! No doubt you’ll be wearing that sweater to NYC! Isn’t that where vacation is going to be? You can! Your color choices are so,pretty! Wow. You are cruising along on that baby. Now I feel like a slacker… I bet you get it done in time. She’s beautiful! I love the colors you chose, and you’ll have it finished just in time for the polar vortex (there’s a term we haven’t heard since last winter!) that’s just starting to bear down on us! Knit faster, stay up later, don’t cook …do whatever it takes because I know you can, I know you can, I know you can! Can’t wait to see you modeling Stopover…she’s a keeper…and so is the sweater! Oh, I like the white. Wouldn’t have thought of that! The yoke’s going to be grand! It’s looking good! You’ll get it done. I know you will.